The pastry takes about 20 minutes, for mixing, folding and rolling. Then another 30 minutes for refrigeration before it’s ready to use. 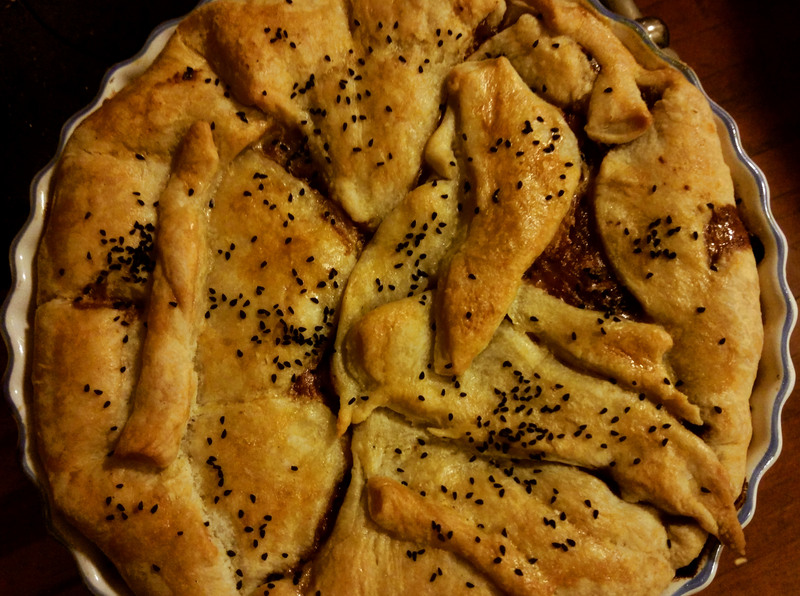 We got the recipe from the Guardian, and follow it pretty much verbatim. The ratio of flour to butter is 2:1 by weight, and you can just scale it to whatever amount you need. Make extra and freeze it. Chop the butter into big chunks, and toss it together with the flour and salt. Using a spoon, slowly add water and stir to incorporate. 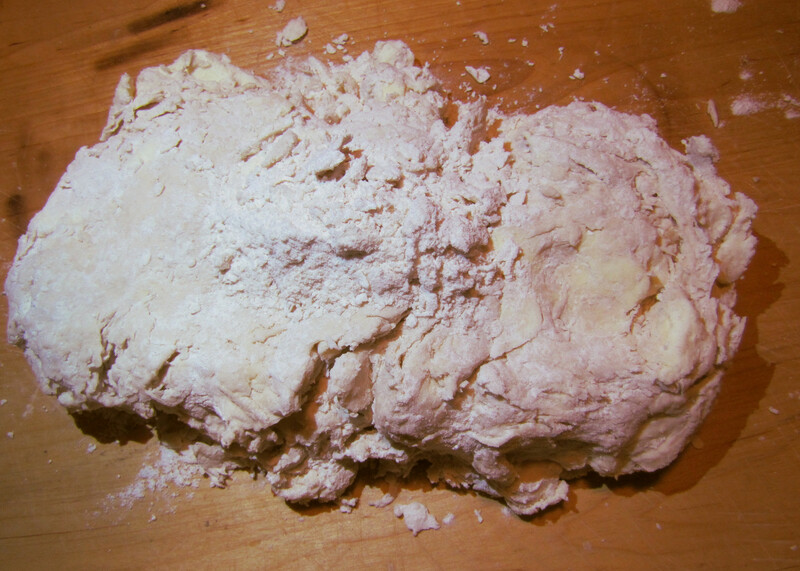 Only add enough water to the flour to get a not-sticky lump of dough. 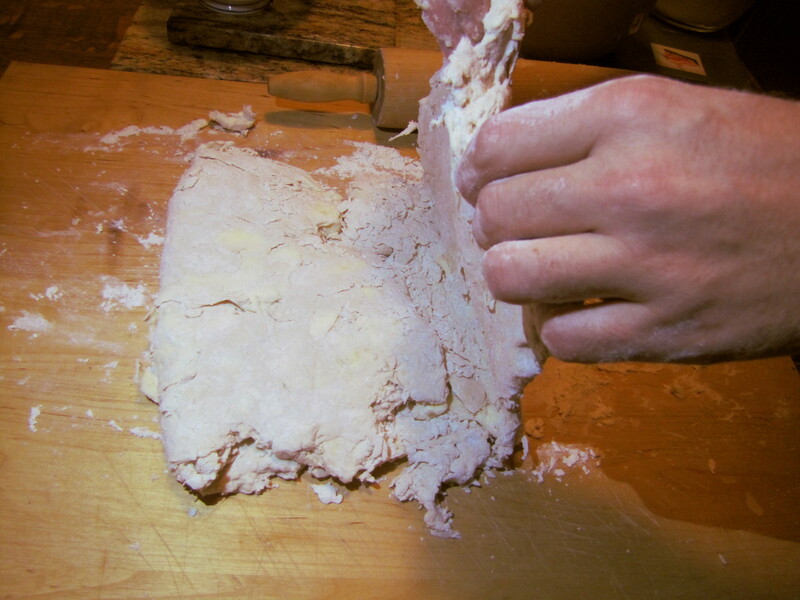 Turn the dough out onto a floured surface (like a table, or a big cutting board). 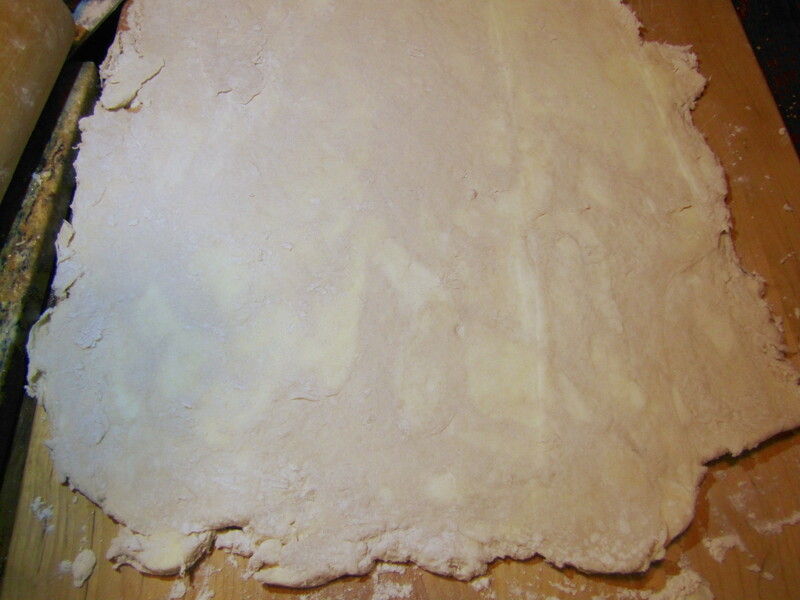 With a (floured) rolling pin, roll the dough out into an approximate rectangle that’s maybe 1/2 an inch thick. Don’t worry about holes or anything. If you get bits of butter stuck to the rolling pin, pull them off and put them back in the dough. Fold the dough like a letter — that is fold the left third of the dough back over the middle, and then the right side, so it makes a stack three layers thick. This is the first iteration. If the dough is wet and sticky, sprinkle some more flour over the top (you don’t want the rolling pin to stick to the dough). Similarly, dust the cutting board if the dough sticks to it. Roll the dough flat again, and fold again. Sprinkle with flour as needed. You’ll do this to a total of about 7 iterations. The lumps of butter from the begin should have disappeared by now, and the dough should be a solid, cohesive, softish ball. Roll and fold a final time. Wrap the dough in plastic wrap, and stick it in the fridge for about a half an hour. It should be cold. At this point you can roll it out and use it for whatever you like. If you want to get a nice egg-wash, beat an egg yolk with a couple tablespoons of milk. Brush the pastry lightly with this mixture, after it’s almost done cooking (about five minutes before you think it’s ready to come out of the oven). It should brown very quickly at this point, so keep an eye on it.